A study out of Princeton looking at 1,567 9-yo children found that for each hour less than the recommended 9-11 hours of sleep, they averaged 1.5% shorter telomeres. On the face of it, they suggest that such finding indicates adverse health outcomes and perhaps sows the seeds for later health problems and accelerated aging. I would propose a different interpretation. 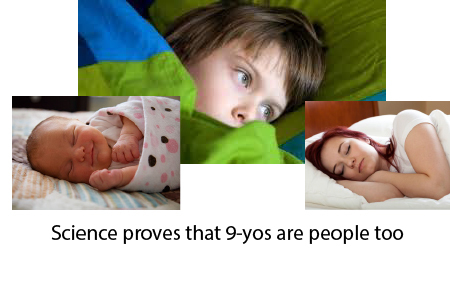 This study shows that 9-yos are people too. In other words, their telomere repair is hindered just like in adults when sleep is impaired. In fact, accelerated aging and health deterioration from poor sleep can occur at any age just as rejuvenation and health restoration can occur at any age. If we take for example the syndromes of premature aging known as progerias, we find that the best natural experiment validating my telomere/stem cell theory of aging has been replicated in many of these children. If any of the components of the telomerase regeneration system is affected, such as having a defective copy from one of your parents, the children can age and die as teenagers. What we see on the cellular level is that when DNA replication integrity are compromised, as they are with poor telomere maintenance, the telomere lengths reflect this, even in children. In fact, the inability to keep up with telomere shortening from replicative senescence is what makes you go from 15,000 base pairs as a zygote (single fertilized egg) to 10,000 at birth. If you are born prematurely, the normal rapid cellular copying hasn’t occurred yet and so it makes sense that a study showed premature infants have longer telomeres contrary to what they thought they would find. I submit that the effects of telomere attrition and stem cell loss are less likely to impair the health since they have such abundant and healthy reserves of stem cells. Of course, relative sleep deprivation is more likely to impair the neurosocial development of children who require neurogenesis and healthy learning from procedural memory creation from R.E.M. sleep. I’m inadequate sleep produces the same downward spiral as it does in adults; the deterioration of social relations, cognitive performance, self-control, and mood stability are all at risk. In the end, if anyone is at risk for problems from sleep deprivation, it is older people in whom a clear link between sleep deprivation and Alzheimer’s Disease as well as telomere attrition and Alzheimer’s has been shown. This inability to remove neurological waste via the glymphatic system (glial lymphatic) leads to problems.What if excessive ego, anxiety, sleep dysfunction, and telomere attrition are not just associated but causal with regard to the specific aging-associated condition? It is the downward spiral that anyone can experience but in a person with less neurological reserve and higher rates of junk accumulation. Perhaps is a misconception that older people need less sleep than children just because tend to do it less. If anything, children are more resilient than older humans who don’t have the healthy and resilient reserve of stem cells that children do. I propose that everyone get at least 8.5 hrs a night and if you can get 10+, all the better to heal your stem cells. The take home lesson is to be found in the age of the subject nor even the telomere lengths- it is in the relative efficiency or deficiency of the myriad of repairs that occur during sleep. Sleep deprivation in youth probably doesn’t impact much just as driving a new car hard doesn’t necessarily lead to earlier failure of that car’s systems; if anything, we should insist that our older humans go “night night” to preserve what stem cell integrity and function they have remaining. In the news that I follow, I am seeing a lot about new leukemia drugs to attack telomerase. Isn’t TA65 trying to increase telomerase. I am seeing a conflict. Can you enlighten me. There is a benefit to limiting the lifespan of cancer cells which are stem cells gone awry. Unfortunately, it is imprecise and would hinder all you good stem cells so in that sense, it is like depriving the entire bank of oxygen when you just want to kill the bank robbers.